James Pickford looked at house price growth since the credit crunch ten years ago. 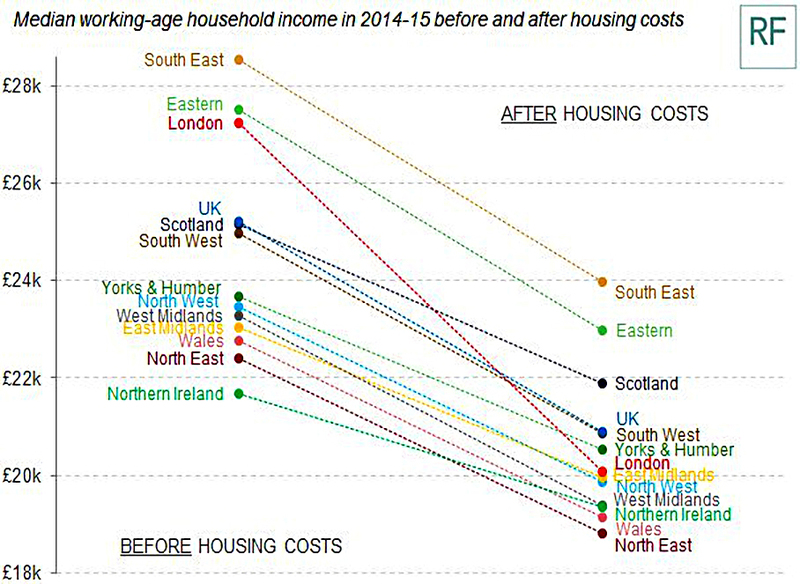 Not surprisingly, London has done much better than the other regions. It’s up almost 80%, compared to a national rise of 18%. In London, the average is £482K. 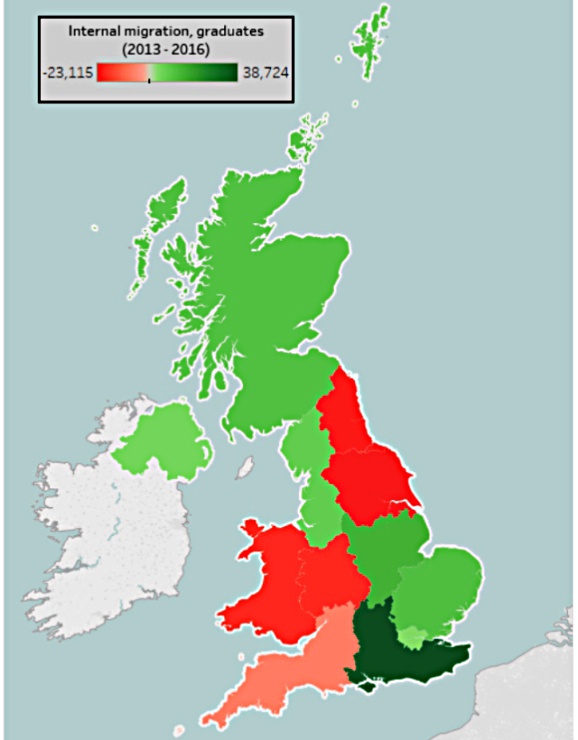 In contrast, prices in the North East remain 9% below the 2007 number. Although prices are high, interest rates are low, so the affordability of houses is better than it looks. But new mortgage lending regulations in 2014 have capped the high salary multiples that people were able to borrow. So instead we have schemes like Help to Buy to get first-time buyers on to the property ladder. London has slowed down now, with annual rises down to 3%. 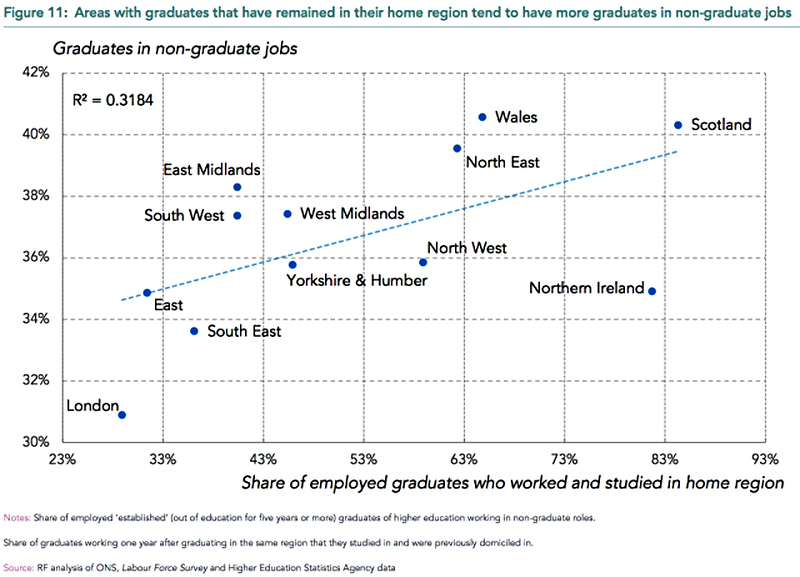 But the best performing region (the East Midlands) is only growing at 7%. James also looked at transactions. But they have been much lower the following 10 years, only once reaching 1.3M pa. 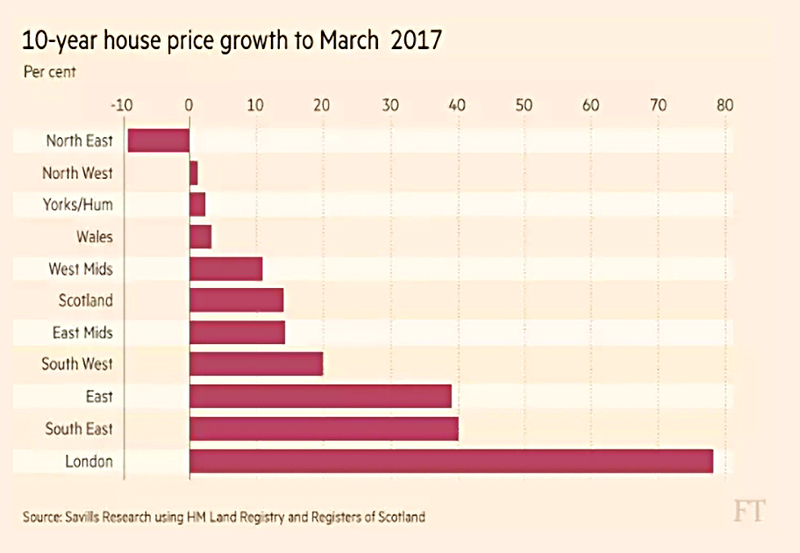 Stamp duty has a lot to do with this – more on this topic later. John Authers was also looking back a decade, to the lessons from the Quant Quake. This was a time when the head of Goldman Sachs complained that he was “seeing things that were 25-standard deviation moves, several days in a row”. That’s the same odds as winning the lottery 21 times in a row. But of course, it was just that Goldman’s models were wrong. It wasn’t the end of quant funds though, and even those from Goldman soon recovered. John sees today’s smart beta funds as the inheritors of the quant fund legacy. The quant funds used factors (mostly value and momentum) to buy the “best” stocks and sell the “worst”. Unfortunately, a run of redemptions on an open fund means that they have to take the opposite steps to generate cash. Which crashes the algorithm, and affects the entire sector. It’s another “crowded trade” story – the rush for the exits quickly becomes a stampede. The smart beta funds are now listed ETFs, which lessens the impact of redemptions, and they don’t usually sell short. But they do keep coming up with ever-more esoteric factors, many of which lose their potency n the journey from academia to the market. John still thinks that “simple” value funds offer protection in an equity downturn, since they own the “cheapest” stocks. But value has under-performed for almost the entire period since the quant quake. 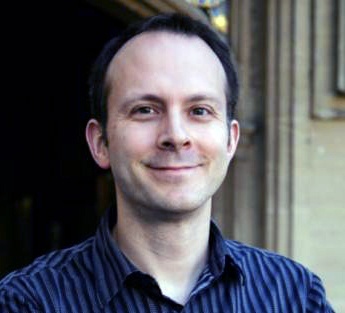 Tim Harford looked at how mental bias leaves us unprepared for disaster. He noted how New Orleans had a near miss from Hurricane Ivan in 2004, didn’t do anything to deal with the lessons learned before Hurricane Katrina devastated the city a year later. 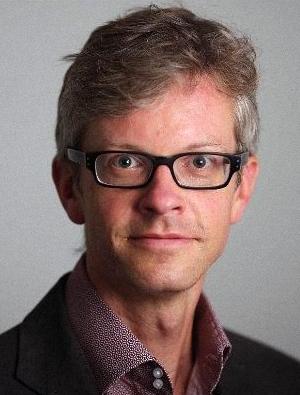 Tim refers to a recent book called The Ostrich Paradox which explains this in terms of “amnesia bias”, and tendency to focus on recent experiences. So that would be recency bias, then. There’s also “optimism bias” whereby people know that bad things (cancer, divorce, market crashes) happen, but they are convinced that they won’t happen to them. When Hurricane Sandy had a 32% chance of hitting Atlantic City, local residents thought there was an 80% chance. But few planned to evacuate, and many said they wouldn’t even install their storm shutters. The act of buying storm shutters and having them on hand – and perhaps stocking up on groceries – was (falsely) reassuring enough. Moving back to the markets, Tim says that memories fade and old hands retire. He notes the recent interview with the Fed deputy Stanley Fischer where he warns how short-sighted it would be to dismantle the safety measures brought in only 10 years ago to stabilise the largest banks. 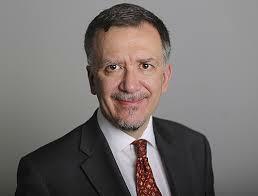 Paul Lewis was under the impression that the pension crisis was all the fault of the employers. He misinterpreted a chart which showed the average amount paid in per worker was rising for DB pensions but falling for DC pensions. The DB number is going up because as salaries rise and service years increase for this privileged group, the cost of meeting the promises made to them goes up. Since the schemes are mostly closed to new members, there are no younger workers with few years and low salaries to bring the averages down. The pension deficit situation for many companies complicates things, but it’s no shock that average DB contributions are going up. 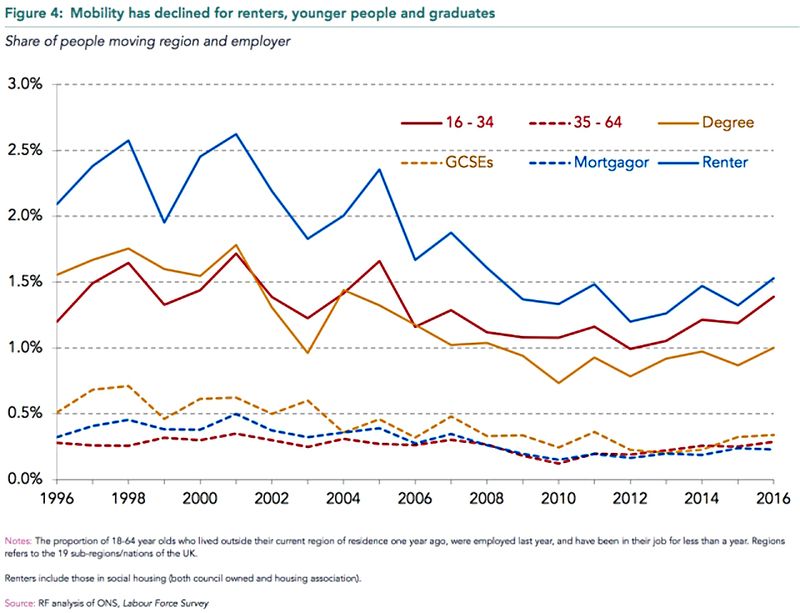 The DC number is going down because auto-enrolment is bringing these younger workers into the DC arena. Contribution rates for these new guys are low and drag the averages down. Employer contributions are just 1% of salary between £6K and £45K, though they are due to go up. But more people now have workplace pensions, and total contributions are higher than before. So things are getting (slightly, and slowly) better, not worse. And you might as well give the employers the credit, as to blame them. 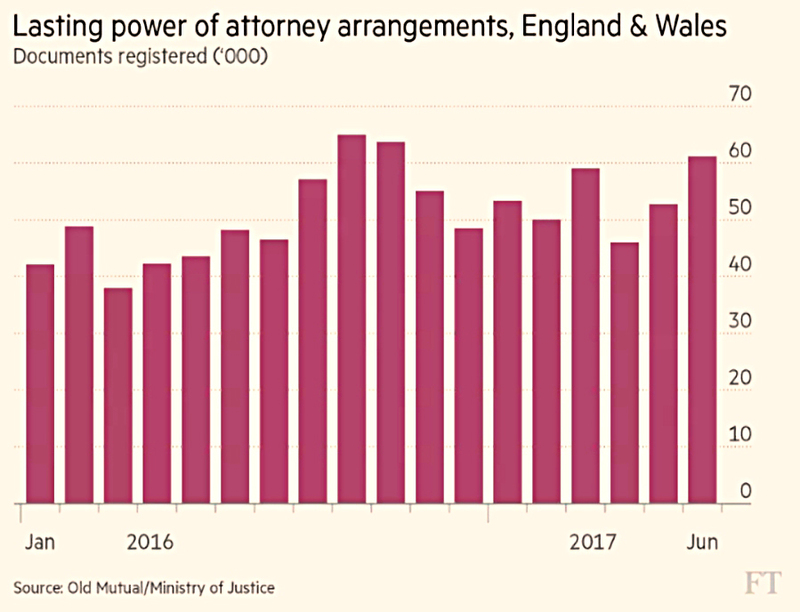 This article is another sign of the rot at the Weekend FT.
Lucy Warwick-Ching wrote about the “dangers” of Power of Attorney (PoA). We covered this topic a few weeks ago, and if you need a refresher the article is here. 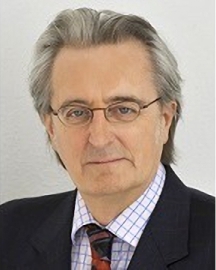 Denzil Lush, a retired senior judge of the Court of Protection (which is responsible for preventing the abuse of PoAs) said that PoAs are “putting people at risk of exploitation by family members, neighbours or acquaintances”. That’s undeniably true, but as with everything, we need to weigh up the benefits and the risks, and look at the alternatives. What can a person who fears dementia do to ensure their wishes are carried out? What proportion of Attorneys are abusing their position? The Office of the Public Guardian launched 876 investigations in the year to March 2016, up from 628 in 2014. But as you can see from the chart above, the base of PoAs has also got bigger. There are more than 2.5M arrangements in place. Lush said that he would never sign a PoA, and that one in eight were abused. 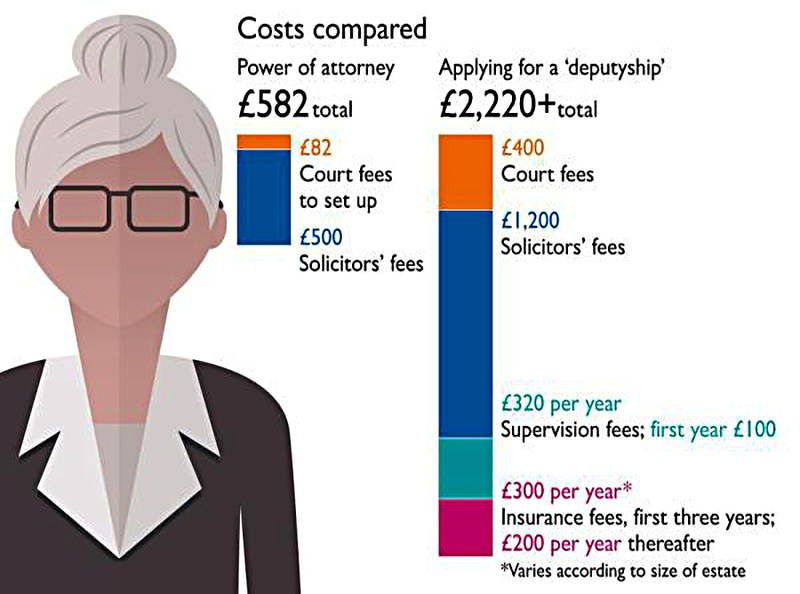 The problem is that if you wait until someone has dementia, the process of applying to the Court of Protection is long and expensive. The key takeaway is not that PoAs are bad, but that you need to be very sure that you can trust the person that you appoint as Attorney. There wasn’t much in the Economist this week, but an article on eponymous firms caught my eye. 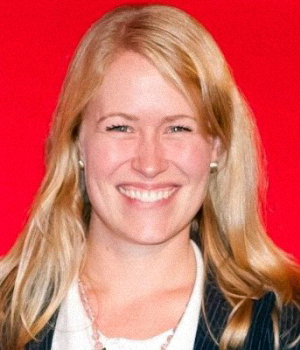 A firm that shares a name with its founder tends to earn higher profits. The underlying study looked at 2M firms in Western Europe. The firms were generally small and young. 19% were named after their founder. The founder name premium came in at 3% better return on assets per year. Common names provide a weaker signal and lower excess returns. The authors concluded that using your own name means staking your reputation on the product, so customers assume that it must be good. Rick over at Flip Chart Fairy Tales had a good article about youth migration. The traditional pattern was that the young and footloose gave London a go when young, then moved out when they wanted better schools and more room to bring up the kids. 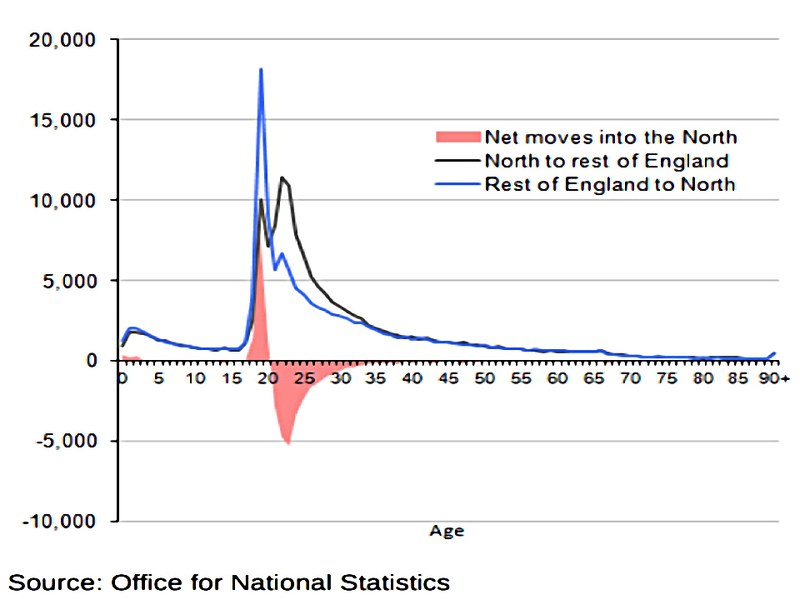 Looked at from the other direction, the North lost people after A-levels, then gained a lot of students attracted by the decent universities, who then drifted back over the rest of their lives. I only have three for you this week. I posted the first one myself. 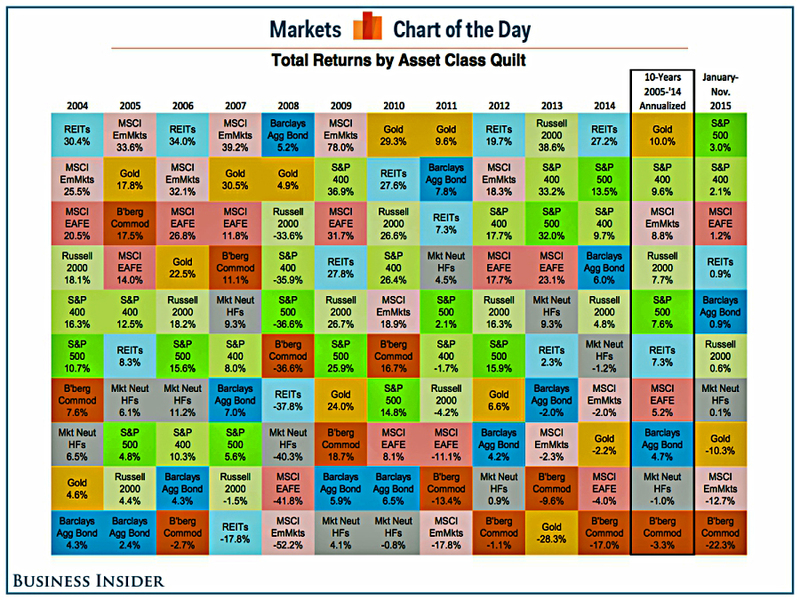 It’s the famous “quilt” of returns by asset class each year. I was debating the relative merits of stock selection and asset allocation. Stock-picking is hard, and a minor factor in performance. Costs, taxes and asset allocation are easy, and the major drivers of returns. 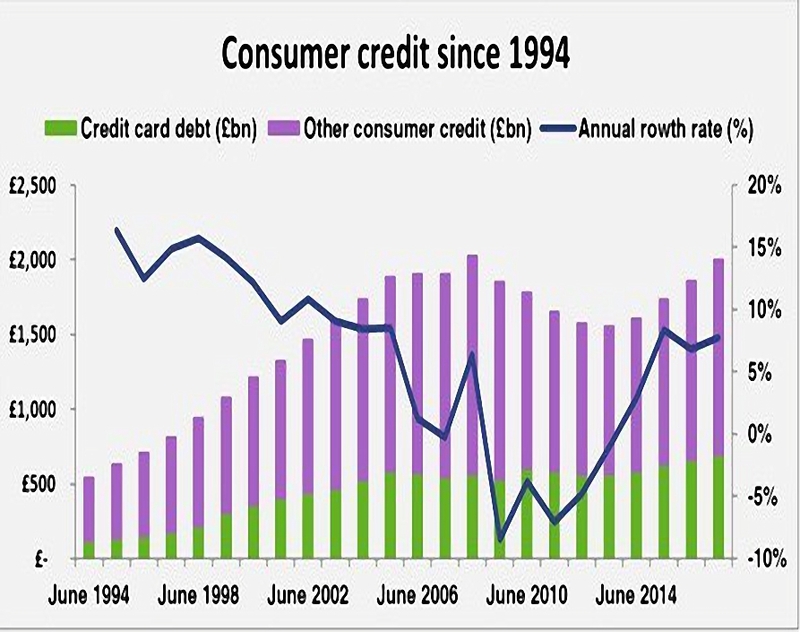 The other two show a couple of takes on consumer credit. The chart above shows that we are at new highs following the 2008 crash. 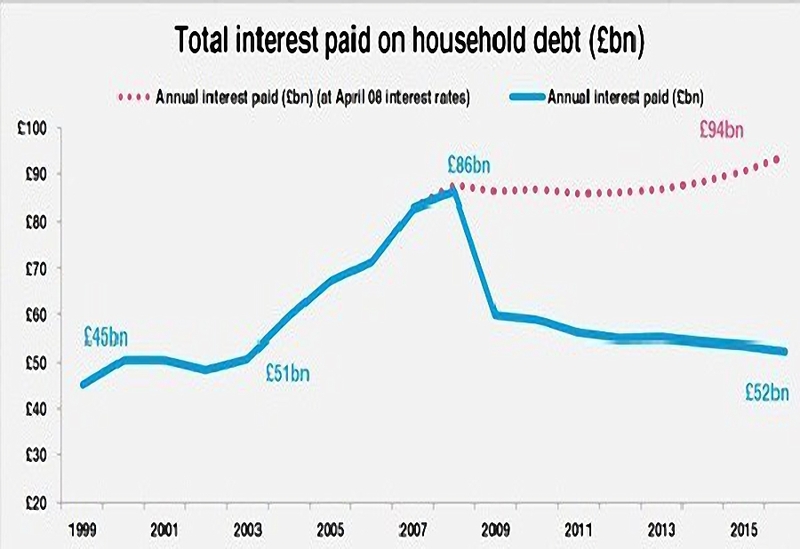 The second shows that low interest rates mean that the impact of this credit is far lower than in 2007. Thanks as always. I am with you on the FT – I used to really enjoy it, and when it was £3 at the weekend it used to be good value. I stopped reading it for a few months (I simply didnt have time at the weekend) until relatively recently, when two weeks in a row I bought it. It went up to £3.50 and then again to £3.80 in what felt like only a year or two. The quality was not what it used to be and I am not sure if I will bother again – certainly not as a once regular reader. Then pension contributions point – very well put, as you say with the younger in DC they are contributing and as they get older and (hopefully) their salaries go up, these levels will also go up, but lets see. PoA is an interesting one and something that has been a discussion through our families – for me I don’t know what I will do but I ought to do something soon! 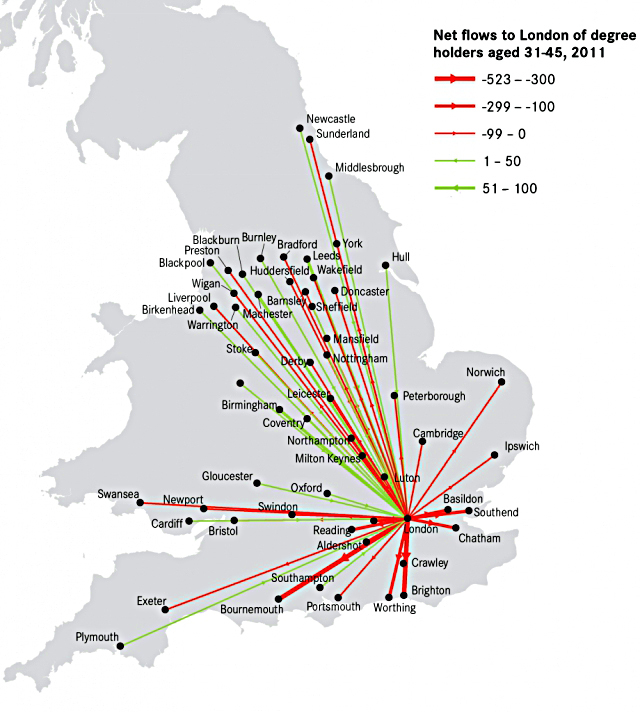 Fascinating reading on the student and London migration – although with current London prices I am not surprised of the challenges. Just out of Uni it is ok to share a place with other known or unknowns, but for a couple wanting their own pad, 1bedroom renting and buying is expensive – that said I still have to decide about if we stay or move out of London when we do eventually pull the trigger.. the big problem is where to go to if we do! We begin today's Weekly Roundup in the FT, where Ken Fisher was writing about QE.